June 10th 2010. Kathryn Hawkins. Thanks to one young Japanese girl, Sadako Sasaki and one thousand paper cranes, millions of people around the world are coming together in peace. Here is her story. Then I realize it was a dream and I wonder how she is. For a while, I’m lost in my sad thoughts and join my hands in prayer before the tablet of the deceased. On August 6th, 1945, World War II’s Allied forces dropped an atomic bomb on the Japanese city of Hiroshima. In an instant, the city was obliterated. When the dust had cleared, people’s shadows remained frozen in place on sidewalks and the sides of buildings. The people themselves simply vanished. On that tragic day, 140,000 civilians were killed. The Sasaki family lived one mile from the spot where the bomb went off. The couple and their two-year-old daughter, Sadako, managed to survive the nuclear attack, though soon after the explosion, thick black clouds of radioactive soot and dust began to fall like snow. Though the family tried to protect themselves, they could not avoid breathing the contaminated air. As time went on, the young family tried to rebuild their damaged lives. The war had ended; they could put it behind them. The Sasakis had three more children, though Sadako was always her mother’s favorite: “She was so considerate and thoughtful that I relied on her,” she wrote. As Sadako grew older, she became a strong, healthy, athletic young woman – she was the fastest runner on her school track team. But when Sadako was twelve years old, she noticed that her lymph nodes were becoming swollen. A doctor’s visit confirmed her parents’ greatest fears: Sadako had been contaminated with radiation poisoning from the atomic bomb. She was dying of leukemia. Soon, Sadako was forced to enter the Hiroshima Red Cross hospital for treatment. She spent months there, her disease progressing day by day. 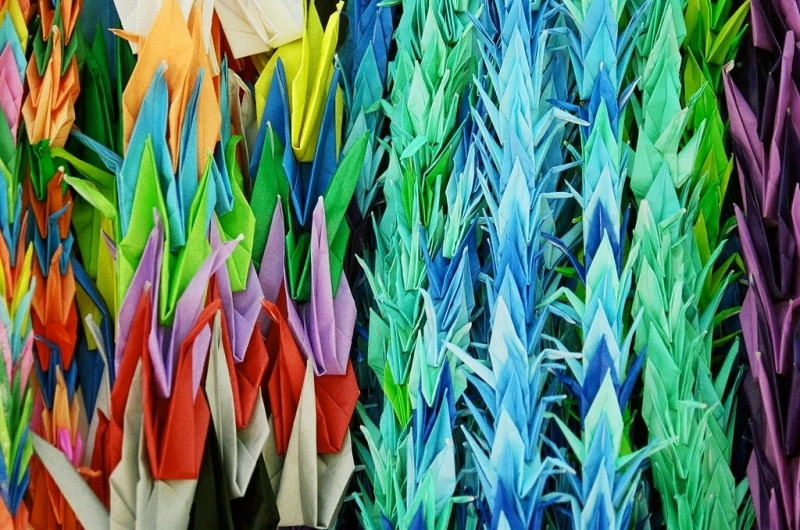 In August 1955, residents of Nagoya sent a gift of colored origami paper cranes to Sadako and the other hospital residents as a get-well present. The gift brightened the sick child’s day – and it gave her an idea. When she got to one thousand, she kept on going, hopeful that the paper birds might magically cure her illness. But it was not to be: Sadako died on the morning of October 25, 1955, surrounded by her family. Although Sadako’s thousand paper cranes could not save her life, they would take flight in another way, serving as a symbol of the growing movement for peace on Earth. The following year, an Austrian journalist, Robert Jungk, traveled to Hiroshima, where he heard the story of young Sadako and her one thousand cranes. He was so moved by the tale of her determination that he told a modified version of her story to the world in a book, Light in the Ruins. In the years since, variations of Sadako’s story have appeared in hundreds of other publications, most notably, a children’s book called Sadako and the Thousand Paper Cranes, written in 1977 by American author Eleanor Coerr. The story has been used in peace education programs around the world. Each year, children and adults from all over the world travel to the Children’s Peace Monument, bringing their own folded paper cranes as a gift to Sadako’s memory, and as a symbol of their desire for peace and for the abolition of nuclear weapons. In hundreds of other cities around the world, from Kuwait City to Santa Barbara, California, children have become involved in projects to create paper cranes as symbols of peace, honoring Sadako’s legacy. Though she could not save her own life with one thousand cranes, her story may yet save millions.